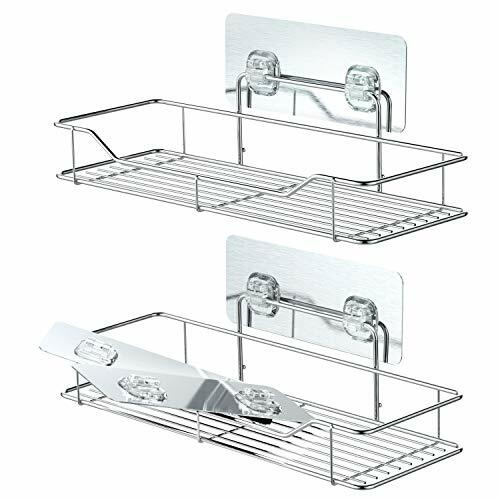 Bathroom Shelves, Veckle Adhesive Shower Caddy Shelf Traceless Wall Mounted Kitchen Rack No Drilling Storage Organizer Stainless Steel Shelf 2 Pack by Veckle at Delta Everett. Hurry! Limited time offer. Offer valid only while supplies last. TIPS: Please choose ONLY the smooth hard wall surfaces, clean and dry, for strong adhesive attraction; DO NOT use it on painted walls or wallpapers as it will take off your paint or wallpapers; If you need to tear off the installed adhesive, please use a hair dryer to heat the adhesive surface and then tear it off.